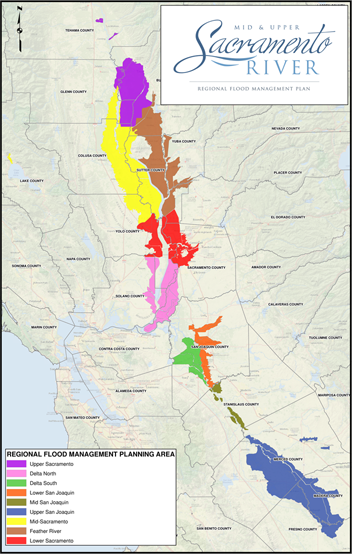 Landowners, public agencies and community organizations are partnering to identify and address regional flood management challenges and opportunities within the Mid and Upper Sacramento River basin. With input from their communities, these organizations will develop a flood management plan by mid-2015 that describes the long-term, local vision for flood risk reduction. Flood management projects included in the plan will be eligible for future state and federal funding. Community involvement is critical to the plan’s development. Opportunities for input will be offered during small and large group meetings, by review of draft plan documents, and through the project website and hotline. The planning process is being funded by the Department of Water Resources with bond funding approved by California voters in 2006. The completed plan will be considered by the State for a 2017 update to the Central Valley Flood Protection Plan, which was approved by the Central Valley Flood Protection Board in 2012. The plan will also connect to the State’s separate but related effort to complete a flood management feasibility study for the Sacramento River basin. The regional planning effort is a chance to help shape the state’s future plans for flood management.